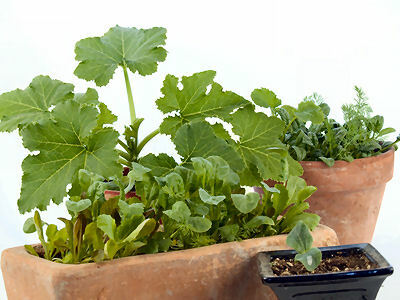 Herb gardening in containers is easy – there is almost no maintenance required. Do you add herbs and spices to your recipes? You are probably a better cook than I am – you would almost have to be – but even I can appreciate using herbs for flavor and scent. And the good news is – herbs were made to be grown in containers! Herb gardening in containers can be successfully done in almost any type of pot or box. Just make sure there is good drainage – this absolutely necessary for growing herbs. Most varieties of herbs prefer fast draining soil, so lots of herb gardeners like terracotta because of its moisture wicking properties. Make sure you choose the size of pot to fit your plants. If the container is too small, the plants will become root bound. It if is too large, all of the plants energies will be spent on root production and they won’t grow or bloom properly. The strong, aromatic scent of most herbs keeps pests away, but if you find you have a problem, make sure to use a safe organic pesticide. A high-quality potting soil is best for herb gardening in containers. Don’t use soil from your garden beds as it is too heavy. The soil will compact when watered and dry up too quickly. Use a potting mix that is loose and will drain well. You can purchase a quality potting mix or make your own. A good mix includes equal parts of potting soil, peat moss and perlite. Herbs in general need little fertilizer, but herb gardening in containers will require some. Mix some organic fertilizer into your potting mix before planting If the color of the plants starts to fade, or they look droopy, add some water soluble fertilizer to your watering routine – use about half the recommended strength. Too much fertilizer will product large plants but the flavor and aroma of the herbs will be reduced. Most herbs like dry conditions – check the watering requirements for each variety. Water you plants when the soil fades in color and is dry to the touch. How much water your plants will need depends on the soil mix, temperatures, size of the plants and containers. When herb gardening in containers, never let herbs sit in water. 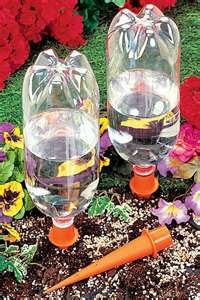 If checking your plants or watering daily is a challenge, consider a slow drip watering system. You can purchase them, but you can make your own at little or no cost. 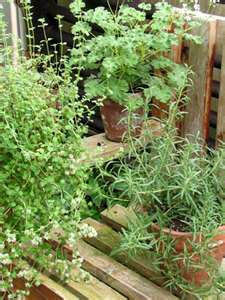 Herbs get their flavor and scent from essential oils that are produced in the plants best when they get plenty of sun. Successful herb gardening in containers requires at least 6 hours of sun per day. Check seed packets or plant labels to find out the lighting needs of your plant and make sure the spot where you locate your container garden will provide that. If you decide to keep a year round garden, and your climate requires you to move your containers indoors, sitting them in a window with a southern exposure would be the best location. Herbs should not be used to treat any medical condition without first checking with your doctor. 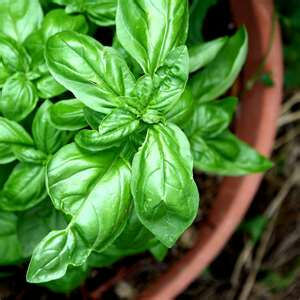 Basil is used in salads (tuna, green, potato or egg), used with fresh tomatoes, eggplant, peppers, zucchini, in marinades or pesto. It works well in combination with tomatoes and mozzarella cheese. Try basil on a sandwich of whole wheat bread with tomatoes and mayonnaise. Thyme is used in chicken broth and stuffing, marinades for meat or fish, lamb, veal, sauces, soups or egg dishes, often used in partnership with tomatoes, works well in oils and butters. Lemon thyme can be used with fish, in tea and in salad dressings. Bay leaf is added at the beginning of cooking soups and stews and imparts a deep rich flavor. The leaf is left whole so it can be retrieved prior to serving. Fresh leaves are stronger than dried. Sage is used in sausage, poultry, stuffing, pork, lamb, seafood, vegetables, breads and is used as a spice rub for pork chops or pork tenderloin. It is also frequently used in salads. Oregano is used in soups, casseroles, sauces, stews, stuffings, eggs, tomato-based dishes, chili and pizza. Chives are used in vinegars, soft cheeses, salads, used as garnish. Its leaves work well in butter and oils. Dill seeds are often combined with onions, cabbage, potatoes, cumin, chili powder, paprika. Seeds can be added to casseroles, lamb, fish, vegetable dishes and sauces. Chopped or whole dill weed can be added to soups, stews, casseroles, meat dishes, pasta, eggs and used to enhance sauces, dips, butters and cheeses. Parsley is used in soups, stews, gravies, salads, meat and potatoes, used as a garnish and a breath freshener. Be generous with this herb in tomato dishes. Rosemary is used with lamb, venison, poultry, soups, stews, fish, tomatoes sauces, vegetables, marinades, and can be used as skewers for vegetables and meats on the grill, works well in a trio with sage and thyme or garlic and thyme, tastes great on steamed red potatoes or peas. Lavender is used in beverages, is an ingredient in herbes de Provence blends and in a variety of sweet dishes. Lavendula angustifolia is best for culinary use and the flowers should be harvested just prior to opening and dried before use. For other recommendations for herb gardening in containers, use the National Gardening Association as a resource. You can search for plants, including herbs, according to growing zone, light recommendations, etc. This is one of my most-used resources.